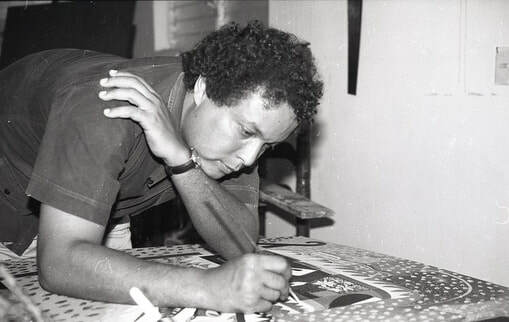 Paul Claude Gardère was born in Port-au-Prince, Haiti in 1944 and emigrated to New York City in 1959 at age fourteen. After attending the Lycée Français de New York, he earned his undergraduate degree from The Cooper Union School of Art in 1967, where he studied under and formed close ties with social-realist artist Robert Gwathmey and sculptor Reuben Kadish. He earned his Master’s of Fine Arts from Hunter College in 1972, having studied under Robert Morris, John McCracken, and Mark Rothko. However, despite his years of formal artistic training, Paul found his purpose as an artist upon returning to Haiti in 1978 with his wife and children. After living and painting there for 7 years, the family returned to New York in 1985, escaping the dangerous climate of the Duvalier regime. Gardère would later go on to complete residencies at The Studio Museum in Harlem, the Jamaica Arts Center, Long Island University, and a 5-month tenure at the gardens of Claude Monet in Giverny, France, courtesy of the Lila Acheson Wallace Foundation - an esteemed opportunity that was particularly influential for his work. ​He received a fellowship from the New York Foundation for The Arts and received the Joan Mitchell Foundation Award for Painting. Gardère had solo shows at Le Centre d’Art and Le Musee d'Art Haitien, the Figge Art Museum, the Jersey City Museum, Lehigh University, and Skoto Gallery among others and exhibited extensively in group shows in the US and Haiti. Works of his proudly reside in the permanent collections of the Smithsonian American Art Museum, Museum of Modern Art Library, The Brooklyn Museum, Le Centre d’Art, Figge Art Museum, Studio Museum in Harlem, The New Orleans Museum of Art, and the Schomburg Center for Research in Black Culture in NY, to name a few. In the year 2000, Paul and his wife, Marcia, moved to the South Shore area of Massachusetts, following a professional opportunity for Marcia, a beloved early childhood educator and Montessori school director. Paul spoke of a special quality of light at the Massachusetts coast and the environment visibly influenced his work during their years there. In 2006, the couple returned to New York and resumed life in their Brooklyn home. Five weeks following Marcia's death in 2011, after 42 years of marriage, Paul fell ill and passed from what his doctors called "a broken heart". He was survived by his two children, Nicolas François Gardère (1973-2016) and Catherine Anne Gardère (b. 1981), who oversees her father's art archives. Though Paul spent the majority of his life in the United States and was naturalized as a US citizen in 1996, Haitian culture and imagery remained the lens through which he explored the larger concepts of post-colonial history, cultural hybridization, race, and identity, in and beyond the Haitian diaspora. "In the notion of diaspora, we find the often harsh reality of the migration, a constant flow and mix of souls. It is said that art transcends geography. More than nationalism or nostalgia, it is deracination itself that nurtures contemporary art. Deracination need not mean loss of homeland. It could be alienation, marginalization, political disaffection. It is a by-product of globalism. For the artist in our time to enter the stream of contemporary ideas, he or she has to abandon the notion of a fixed center. He is his own center, being if he chooses in several places at once, speaking several tongues or being able to look at any given situation from a variety of points of view. The concept of multiple narratives, a story with two or more points of view, is the operational principle of my work."